Nest Learning Thermostat – 2nd Generation T200577 is a special intelligent thermostat that understands you and your personal home environmental condition preferences. The name learning is used to indicate that the product can interact, remember, and even alert you about specific conditions of your home environment any time you need it. All you need is your laptop, tablet or smartphone. One of the main features of this item is Auto-Away, that turns off the thermostat when all the people are away. Another crucial feature is the Auto-Schedule that is self-programming to keep the temperatures at ideal ranges depending on the time of the day or night. The third selling point of this thermostat is the second generation design which is thinner and lighter. It also has an efficient power structure that enables it to operate at lower voltages. When you buy Nest, it comes with an inbuilt battery that helps to keep the system running even when the power supply is turned off. The most critical parts of the system are the sensors. 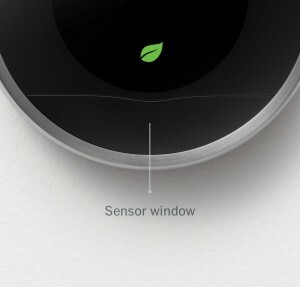 Nest comes with temperature, humidity, ambient light, near-field activity, and far-field activities sensors. Special second generation design: This product’s design is an improvement of the previous first generation model. The second generation thermostat is thinner, lovelier and lighter. What’s more? You’ll be contributing to the fight against global warming because the device operates on lower voltage. You can place the product on the sitting room and have it serve as part of interior décor because of the shiny and round stainless appearance. As a low cost product, the T200577 has a power consumption rate that’s lower than most others by about 20%. The Auto-Schedule is a special intelligent system that helps the system to understand the user and the immediate environment. The learning program has a self-updating memory that will always remember the ideal temperature for a house. If the temperature of the client’s house run at an average 77ºF after 8.00 am, the Nest will reset itself automatically even if you do not adjust it manually. This is very helpful to avoid interruptions, and complex diary schedules. You can therefore go about your daily schedules even when you have children on the house without getting worried that you forgot to reset the thermostat. This product has won the hearts of many because it understands when to regulate temperatures and when to automatically go off. The Auto-Away feature enables the machine to detect when there is nobody at home and automatically switches off. This is important in two ways. First, it helps to save on the energy cost because no power will be used when the system is off. Second, it helps to increase the lifespan of your thermostat by reducing wear and tear when the machine is off. Easy to control remotely. The modern society requires a seamless connection between the home, office, business, and other areas of interest. Nest is Wi-Fi enabled hence it connects easily with the house owner’s Smartphone, laptop, or tablet for easier monitoring. You can check the house temperature, the behavior of the thermostat, or even readjust it to specific ranges depending on your preference. Easy to install. 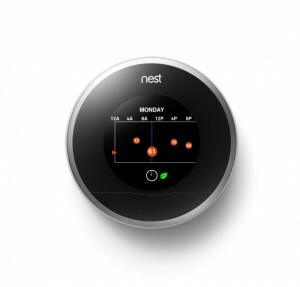 Nest is one of the friendliest thermostats when it comes to the installation procedures. You will require only about 30 minutes installing and before you know it you’ll have the thermostat operational in your house. This helps to reduce associated costs of installation and minimize disturbances. Easy to maintain. The intelligent system fitted in the Nest helps to easily diagnose problems and reset them from your smartphone, tablet of laptop. Once you open the application controlling the thermostat, you can reset to defaults or reinstall applications to make the product operate just like when it was new. Easy to abate disasters. The main home disaster that causes pain, anguish, loss of property, and even life is fire. However, Nest Learning Thermostat is fitted with sensors that will tell when critical levels are reached and surpassed. More importantly, the product relays the message to you through your smartphone in real time so that you can take the necessary action and come up with a solution before it’s too late. The stainless outer casing helps to increase durability of the product. In case it gets dusty, you can restore the shiny and lovely appearance by simply dusting it using a dry piece of cloth. Since Nest is remotely controlled, it is an easy target by cyber criminals. Cyber criminals are always interested in gathering as much information as possible about you and your home. You can however counter this problem by making sure that the system’s passwords are encrypted and kept as secretive as possible. Possible conflict between direct and remote control. Though this thermostat is one of the latest models, remote control presents a challenge for homeowners who leave people in the house. The main people who should control the thermostat are those left in the house. What you consider as ideal temperatures might not be ideal for the people left in your house. This problem can however be addressed by proper communication channels. They can also be shown how to control the thermostat. The highly automated system of this thermostat reduces vigilance of the house owner. This is because they can control the temperatures of the house from their smartphones, laptops, or tablets connected to the internet. The disconnect risks reducing frequent checkups and inspections that are critical in citing water leakages, cracks in the basement, and fading paint coats. 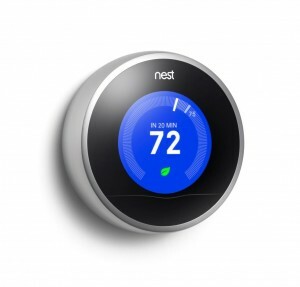 Nest Learning Thermostat – 2nd Generation T200577 is one of the most advanced temperature regulators for homes. The features included on the item are intelligent and make it easy for homeowners to create the most tranquil home environment regardless of whether they are at home or away. The automation is also helpful in preventing disasters especially the ones that result from the owners forgetting. This product is one of the surest assets that will change how you, your family, and even friends enjoy special moments in your house.